We may not be out on the high seas but we can do some arm-chair traveling. Set sail and join in this challenge by creating a card with a BOAT OR SHIP image. Our beautiful, inspirational sample for this challenge was created by Donna. Donna, your ship card is fabulous. 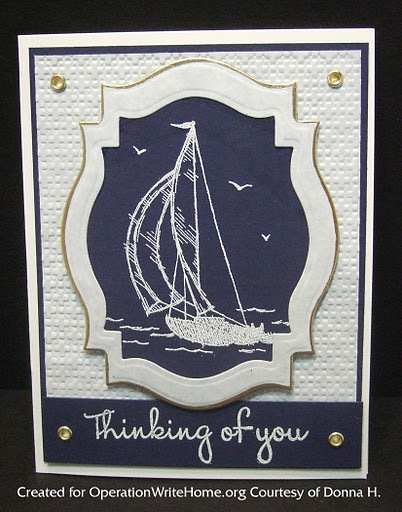 I love the way you used the Spellbinders die for the image, it looks very nautical. I also like the cream, navy, and gold colors. Donna, you card knocked my socks off! It's so pretty the way you framed the image and I love the colors! NJ!! Wow! What a gorgeous sample card!